Looking east over the stock dam - the 2018 planting area on the lower right, the proposed 2019 planting area on the upper left. PGG Wrightson kindly donated 2000 Combi Guards in 2018. We started using plant protectors in 2016, and they have dramatically improved the survival rate of the trees. The potting mix we use for the silver tussock propagation is kindly donated by Daltons. Numbers of nest boxes, built and placed for the endangered white-flippered penguins nesting on Quail Island, were damaged or destroyed by rock falls during the 2011 earthquakes. As a result of a co-ordinated effort between business sponsors and volunteers, the Trust placed 25 new penguin nest boxes in strategic, secluded sites around the island in June 2013 in a bid to build up breeding pairs on the island again. The boxes were built by volunteer Andrew Harris from timber donated by Horncastle Homes, and Lyttelton Port of Christchurch transported the boxes to the island. In 2015 another 25 nesting boxes were constructed by the helpful staff at Bunnings Warehouse Shirley, and the boxes are due to be placed on the island over the next few months. It is hoped that the predator-free environment the Trust staff and volunteers work to maintain will help build up nesting penguin numbers to pre-earthquake levels. Providing safe nesting sites is not only good for the white-flippered penguin population, but good for the general habitat and soil fertility too. Studies have found that their guano (and that of other ground nesting birds) encourages native plant regrowth. The Trust has 22 penguin nest boxes for adoption at $500 each, available to individuals and businesses interested in supporting the penguin project and other conservation and ecological restoration on the island. Each box will be named after the sponsor (as well as being listed as a sponsor of the penguin project on our website) – and we will provide regular project updates. An ideal penguin box site on Quail Island. Volunteers carry new penguin nesting boxes built by Bunnings to the island on 15 July 2015. Click here for some other ways to help the Trust and further eco-restoration on Quail Island. Find out more about the white-flippered penguins on Quail Island. Tutto Bene in Merivale has provided operational funding in 2018. Affordable Italian food at it's best! Formaggio's in Beckenham has provided operational funding to the Trust in 2018. Real Italians do it better! 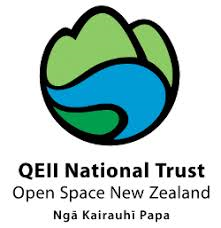 Trees that Count continue to support the Trust with funding from Kiwibank and the Tindall Foundation. Boffa Miskell generously purchased 600 trees and Combiguards for the Trust and planted them in 2017.
have helped us with a grant in 2016 to purchase tools and weedkiller.